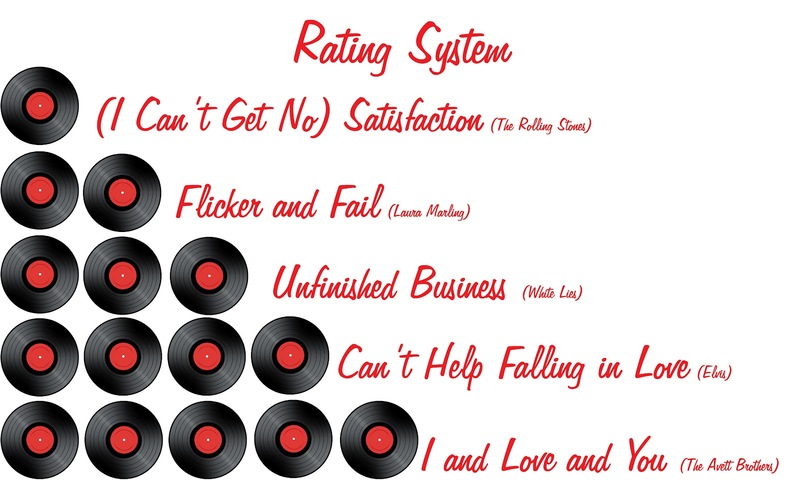 One Record/I Can't Get No Satisfaction - As the name implies, I just weren't feeling this. Whether it was the pacing, the voice, that characters. Rarely do I give out one record. If I do it is justified in the content of the review. If it's an album that get's a one record - well, it probably means that my ears were bleeding by the end, or that I didn't finish it at all. Two Records/Flicker and Fail - It started out pretty good, but then suddenly it burnt out. Either the story lost that little extra bit it needed to make it great, or something else. Two record books come few and far between and the reason for their two-record-ness is justified within the review. The same can be said for two record albums. Three Records/Unfinished Business - Right in the middle, there were good things and bad things about it. Usually this means I liked it, but I didn't love it. Concerning albums, sometimes this is given if an album doesn't live up to it's predecessors. 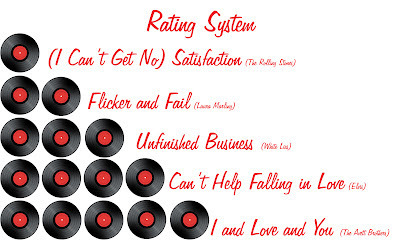 Four Records/Can't Help Falling in Love - This is really high up there on the "greatest" shelf. 'i love books, there are a lot of four record books on my shelf's. There are even more four record albums. I'll be the first to admit that I listen to music that I like. Usually new music is suggested by a band or record website that I already love. Five Records/I and Love and You - Writing doesn't get much better than this. Music doesn't either. In a word, a five record means the thing was freaking sublime. The above mentioned songs are used in name only, and are not intended to imply that I do not like said song, as a matter of fact, the five songs listed are some of my all-time favorites.